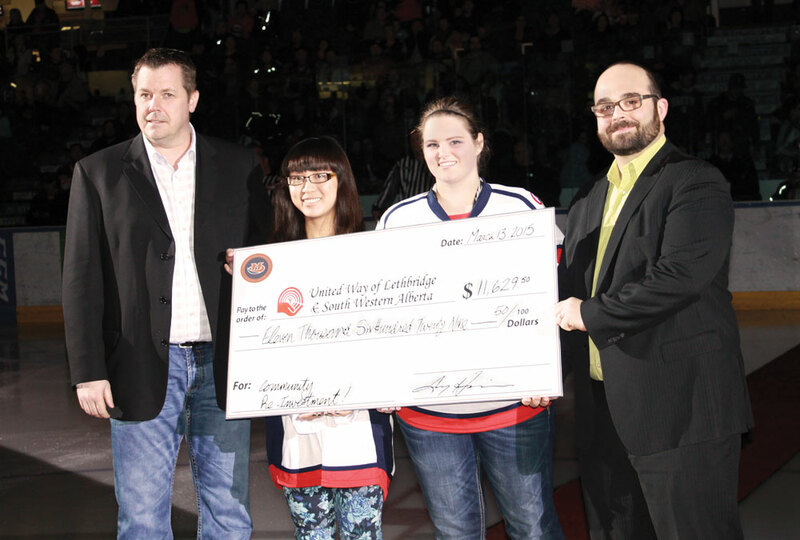 Hurricanes help raise $11k for United Way! At the Hurricanes game on Friday, March 13, business manager Terry Huisman presented a cheque to United Way executive director Jeff McLarty for a total of $11,629.50, money raised with the support of the Lethbridge Hurricanes Hockey Club. United Way volunteers Jannell Or and Sawyer Daley were on hand to help accept the funds. The funds were raised with volunteer support through Hurricanes jersey raffles in the fall of 2014, chuck-a-puck competitions and silent auctions through the spring of 2015 and the Tip a ‘Cane event at Mr. Mike’s Steakhouse Casual on Feb. 24. All of the funds raised will be applied to United Way’s Community Fund, which in 2014 supported 23 organizations in Lethbridge & South Western Alberta to run programs for individuals and families.